Last Christmas I had the opportunity to review some Hipsy Headbands and am very happy to say this year I have two more to share with you - and give away as well! They do stay in my hair all day long - truly amazing! Before last year when I first reviewed Hipsy, I had never used headbands, because each time I tried them - throughout my life - they always "popped" off the back of my head. I must have an oddly shaped head or something! 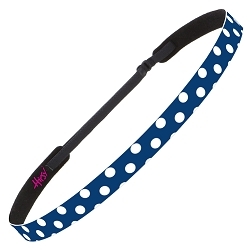 However; Hipsy makes the most amazing variety and designs when it comes to headbands and happily, their product does not "pop" off the back of my head, so today, once again, I'm writing about Hipsy.com and announcing a fun giveaway as well - and a special code you will be able to use anytime . . . no expiration, to save 50%! Before I share more about Hipsy headbands, I want to give you the special code . . . on any order you place, at any time just use the word - HAIRBLING - and you will save 50% - yes, 50%! I use it on every order I place with Hipsy. Now, for some information on Hipsy. They say; "The Hipsy company was formed in 2012 with the shared desire of its founders to create the ultimate headband wearing experience. First they set out to discover women’s biggest complaints about wearing a headband. 'It’s too tight.' 'It’s too loose.' 'It rides up.' 'It slides down.' The solution to those problems became the overriding goal of Hipsy headbands. Hipsy’s designers focused on designing them to be comfortable, easy to use, and stylish accessories which provide the right amount of control. Today, American-made Hipsy headbands are sold by some of the largest retailers in the US, and are rapidly gaining popularity in international markets as well. 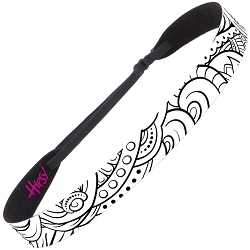 Hipsy LLC manufactures its 'perfect-fit…perfect-hold,' high quality headbands in a variety of colors, styles, patterns, and custom prints. Hipsy’s complete focus is customer satisfaction . . . with products which are built to last, and live up to the Hipsy Lifetime Guarantee. Your comments and ideas are welcome . . . actually treasured, at headsup@hipsy.com." I really like my glittery Hipsy headbands! I love how there is such a huge, yes huge, variety of styles, sizes and designs from which to choose when it comes to Hipsy headbands. If I had granddaughters, they would absolutely receive Hipsy headbands from this grandma! If you are looking for something fun, unique and something which could be used each day to give as a gift exchange, stocking stuffer, add-on gift, birthday gift or just for fun for any day, any girl, any age, then take a look at Hipsy! I'm very happy to say, Hipsy sent me two of their lovely headbands - their very pretty, Hipsy Braided Navy Glitter Headband and their Hipsy Adjustable & Stretchy Floral Xflex Headbands Grey Floral for me to give away (USA only). If you are over the age of 18 and would like to enter this drawing for two Hipsy headbands, which will be on November 11, 2018, please comment below to share about when you might wear a headband, or what you think would be a fun design to include on a headband - I would say something which sparkled, but since Hipsy already has glittery headbands in pretty much every color, they have what I would suggest. In addition if you have followed on Google Friend Connect, followed by liking on facebook with the tab in the "Find us on Facebook" box ON THE BLOG or at this link (not just liking the post) and/or have followed grandma's cookie jar by email you will receive one entry for each of these which you have done. Plus, if you "share" this post, you'll receive another entry (please let me know if you share). This will help me be able to draw names from among people who would like to win Hipsy Braided Navy Glitter Headband and the Hipsy Adjustable & Stretchy Floral Xflex Headbands Grey Floral and it gives you several ways to enter the give-away! Thank you for reading grandma's cookie jar and for sharing it with the people you know! I think a good design would be a wider headband that you could double over if needed. I would wear a basic design with comfy clothes. I would wear it when I go shopping. I think tie dye would be fun. I can think of many on my gift list who would love to receive one of these! I would wear one running errands and lunch with friends. I am an email subscrber. Around the house and running errands. Liked, shared, following on Facebook, Google friend connect and Email. These are cute headbands! My daughter asked for headbands on her Christmas list. I think a cute design would be ballerinas.I wear headbands frequently so there is not just one special occasion for them.